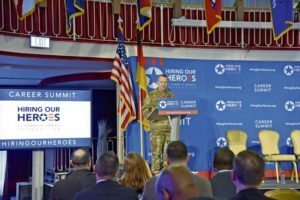 Col. Jason T. Edwards, U.S. Army Garrison Rheinland-Pfalz commander, speaks to job seekers attending the Hiring Our Heroes Career Summit, April 3. The event allowed participants to connect with the local workforce, engage with the installation, community, state and federal representatives, local and national employers to find perspective jobs. 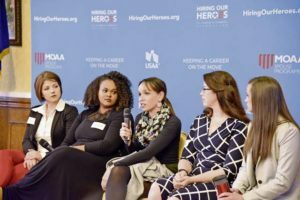 Local employed spouses discuss their first-hand employment experiences to job seekers attending the Military Spouse Symposium at the Hiring Our Heroes Career Summit, April 3. 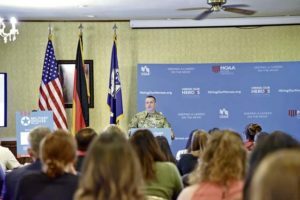 The panel members provided military spouses with advice, assistance and their expertise on leveraging their personal experiences to obtain employment in the local area. 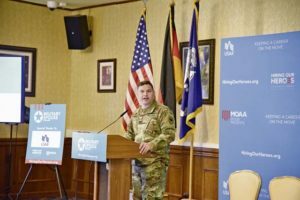 Maj. Gen. Steven A. Shapiro, commanding general of 21st Theater Sustainment Command, greets attendees of the “Keeping a Career on the Move” Military Spouse Symposium at the Hiring Our Heroes Career Summit, April 3, at Armstrong’s Club, Vogelweh. 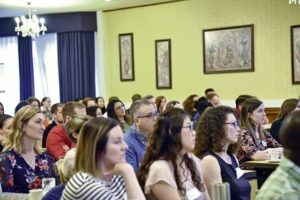 The symposium was a personal and professional development conference for spouses who are planning to enter or re-enter the workforce. Attendees of the Hiring Our Heroes Career Summit listen to panel members.